LIFT – The ripest watermelons have the most water. 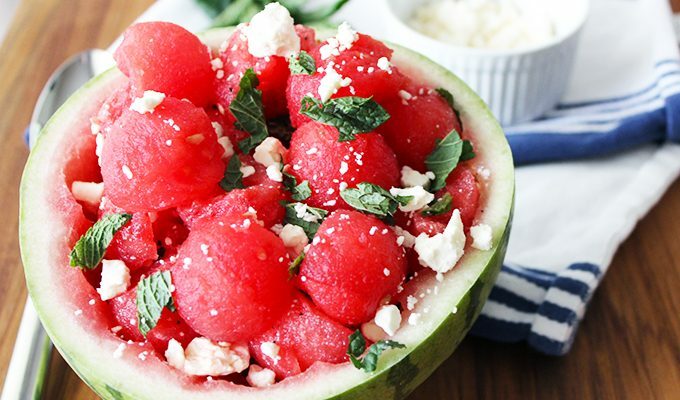 And since watermelons are 92 percent water, your watermelon should be relatively heavy for its size. TURN – Turn your watermelon over and check out its bottom, which should have a creamy yellow spot (also called “the ground spot”). This is where the watermelon sat on the ground while it soaked up the sun at the farm. If this spot is white or greenish, your watermelon may have been picked too soon and might not be as ripe as it should be. LISTEN – Position the melon two inches from your ear, thump or tap it with your free hand. If not ripe enough, it will sound solid; if too ripe, it will sound thick; if perfect, it will resonate as hollow. Now that you have chosen the best watermelon, add the ingredients below for a great summer salad! In a large bowl, whisk the first four ingredients. Add the watermelon, feta, olives and onion and toss gently. Garnish with the mint and serve.